Lately, things have been a little dark in this space. A little too sad and depressing. I’m getting itchy and restless. There have been hints of beauty, even hilarity, in the midst of the normal sniffles and general unpleasantness that define this season for me, and it’s time to breath and enjoy a bit. One thing I typically start doing more of this time of year is eating out. There are a lot of new(ish) places I look forward to checking out now that I am awake from my long winter’s nap. But last weekend I found myself wanting to play with seasonal flavors (well, the ones I can find right now) in a dish, or a version of one, I enjoy from my favorite standby restaurant in my area. Maybe recreating this restaurant dish serves to bridge the transition from eating in to eating in and out. But it was fun, and it is definitely going on the rotation. It’s impossible to choose a favorite restaurant; I’m so pleased by how far dining in and around Boston has come. But I find myself going back to Ana Sortun’s Oleana in Cambridge, MA the most, especially when the weather is pleasant and the dreamy patio is open. The kitchen at Oleana has been cranking out delicious Turkish- and Mediterranean-inspired (emphasis on inspired) food since 2001. Each dish is predictably stellar — and that’s a kind of predictable I can get behind. It’s the restaurant I recommend to out-of-towners because, while its dishes aren’t particularly cheffy, its reputation don’t lie. I like to think of it as my Nopi. 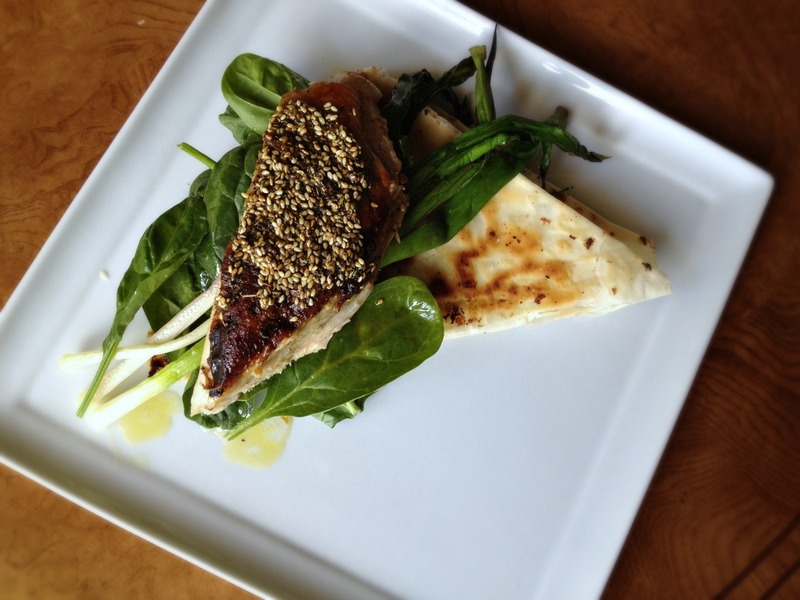 There’s one dish that never leaves the menu: Misty Knoll Flattened Lemon Chicken with Za’atar & Turkish Cheese Pancake. I rarely order chicken out, mainly because I very haughtily think of myself as a chicken master and find myself bored with and underwhelmed by the every-restauarant roasted half chicken over [insert vegetable here] purée, which promises moist meat and crisp skin but rarely meets my crackling standards. But this is different. This dish is explicitly good. If I could feel what I feel when I eat a composed bite of everything on that pewter plate…well, I would feel very good. 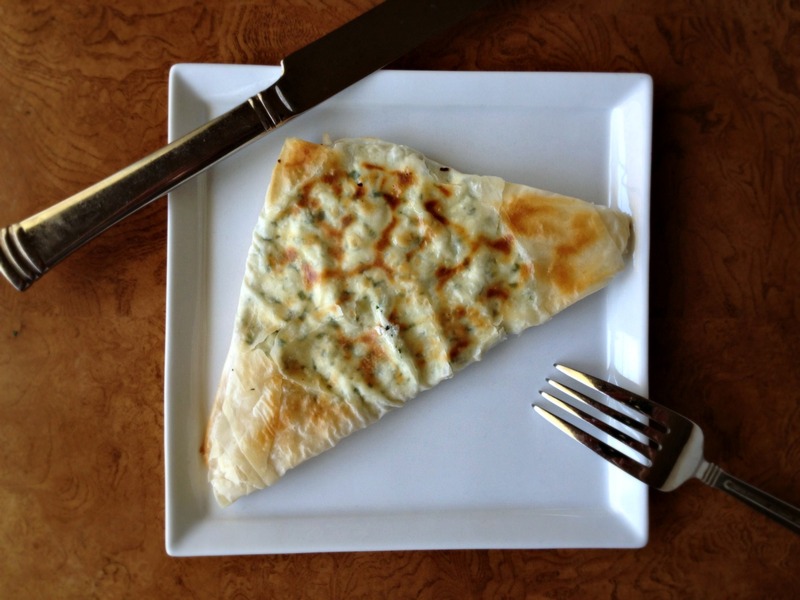 A tangy, herbal, crunchy slathering of za’atar covers potato chip–crisp chicken skin covers moist and deeply flavorful (yes, deeply flavorful) boneless layering of dark and white meat chicken covers soft pastry encases puffy, salty, sheepy, pillow of molten cheese. Phew. I like feeling very good, so I set out to make it at home. In attempting to recreate this restaurant dish in my far-from-restaurant kitchen, I did take a few liberties. Deboned and folded in half brick-flattened chicken became butterflied brick-flattened chicken (because I can just picture the eye rolls as I went into the chicken-deboning procedure). Stuffing lemon confit and cubes of butter under the skin à la minute was traded for pre-salting (dry-brining) overnight with a mix of kosher salt, lemon zest, and minced garlic. The hot restaurant flattop translated to a hot and heavy cast-iron skillet. The wide availability of phyllo dough helped it to trump yuftka for the pancake. The pancake gets cooked in the chicken drippings in the same skillet while the chicken rests. Garlic oil is used three ways. And ramps and scallions were added for springtime allium pop. And the results? Well, let’s just say, I like feeling very good. The longer the salted chicken sits in the refrigerator the more moist and deeply seasoned it will be. The assembled pancakes can be prepared up to 24 hours in advance. Leftover pancakes (this recipe makes 6, because you want more pancakes) can easily be reheated. I like to carve the chicken breast off the bone and serve it right over the pancake, so you get a similar effect as you would at the restaurant — cutting right through chicken to pancake. I serve the leg on the side for this reason. Depending on the size of your bird, the heat of your burner, and the quality of your skillet, cooking times can vary fairly widely, so be sure to look for temperature and visual cues for doneness. Heat olive oil and garlic in small saucepan over medium-low heat until simmering, stirring occasionally, about 3 minutes. Once simmering, cook, stirring constantly for 1 minute. Strain mixture through fine-mesh strainer set over bowl, pressing on solids to extract oil. Set aside garlic; let garlic oil cool and refrigerate. Place chicken breast side down on cutting board and, using kitchen shears or sharp knife, remove backbone of chicken. Flip over chicken and press on breastbone to flatten chicken. Mix lemon zest, 2 teaspoons salt, 1/4 teaspoon pepper, and cooled garlic in small bowl. Pat chicken dry with paper towels. Using fingers, separate skin over breast and legs and thighs from meat and rub garlic mixture over meat. Season skin (lightly) and underside (not as lightly) of chicken with salt and pepper. Transfer chicken to wire rack set in rimmed baking sheet and refrigerate, uncovered, at least 2 hours and up to 24 hours. Meanwhile, prepare the pancakes. Heat 1 1/2 teaspoons vegetable oil in small skillet over medium heat until shimmering. Add scallions and cook until softened, 3 to 5 minutes; set aside scallions to cool. 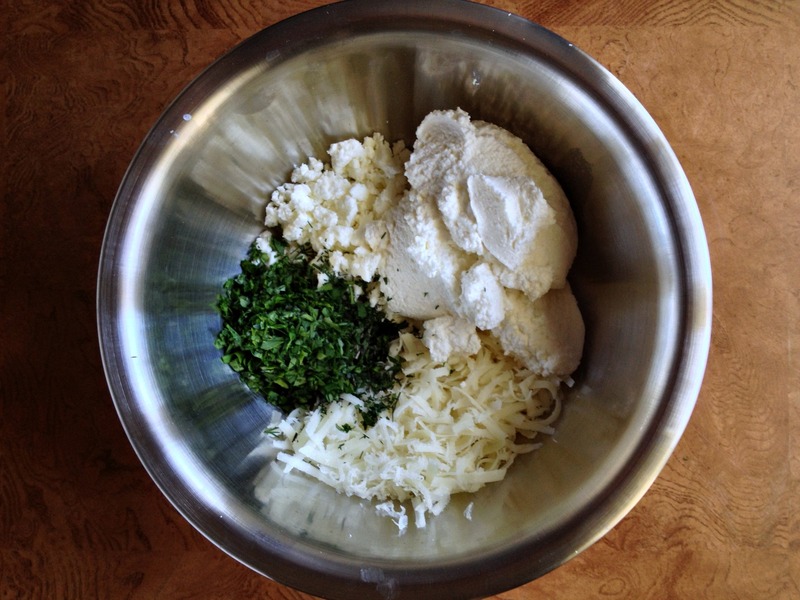 Mix ricotta, feta, kasseri, parsley, mint, dill, cooled scallions, and salt and pepper to taste together in bowl until combined. Fold 1 sheet of phyllo in half and brush 1-inch border with oil. Place heaping 1/4 cup cheese filling in center of phyllo. Bring in corners to create diamond then fold 1 side over filling to create triangle. 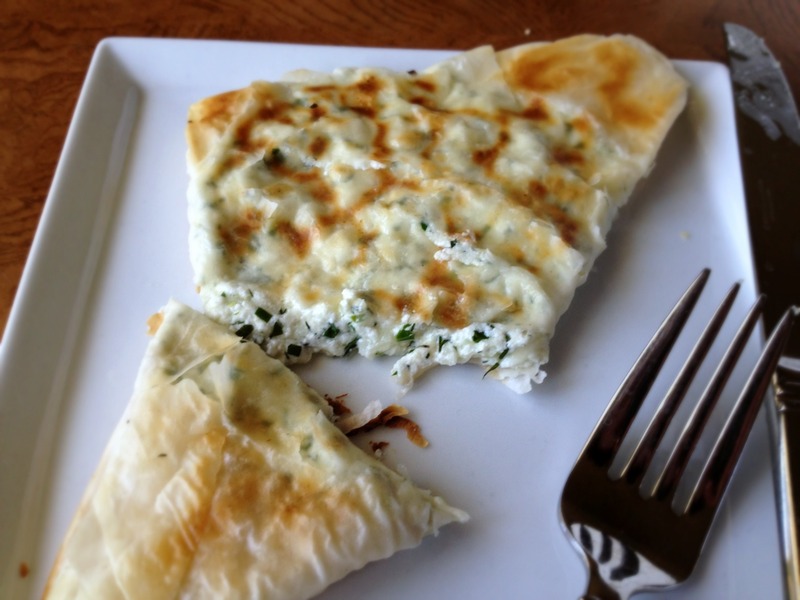 Place triangle on second sheet of folded brushed phyllo to wrap so there are no open seams. Place on lightly oiled baking sheet and brush top with oil. Cover with plastic wrap. Repeat with remaining phyllo and cheese filling. Store pancakes in refrigerator (up to 24 hours) until ready to use. When ready to cook chicken, adjust oven rack to lower middle position, heat oven to 425 degrees, and place 2 aluminum foil–wrapped bricks on rack. Mix za’atar and 2 tablespoons garlic oil and set aside. Toss ramps with some garlic oil to coat and season with salt and pepper to taste; set aside. Pat chicken dry with paper towels. Heat 1 tablespoon vegetable oil in 12-inch cast-iron skillet until just smoking. Place chicken, skin side down, in skillet and immediately (and carefully) place 1 hot brick, positioned lengthwise from breast to leg, on either half of chicken. Cook for 10 minutes. Reduce heat to medium and cook until skin is deep golden brown and crisp, about 5 minutes longer. Transfer chicken, with bricks in place, to oven and place ramps over bricks. Cook chicken for 10 minutes. Remove ramps and set aside. 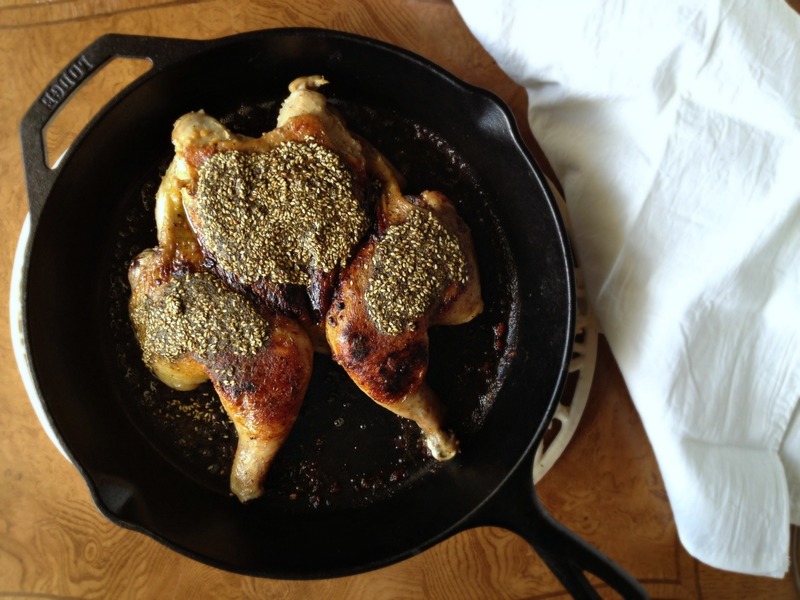 Remove bricks, flip chicken, and coat breast and thighs with za’atar mixture to taste (the layer should be fairly thick). 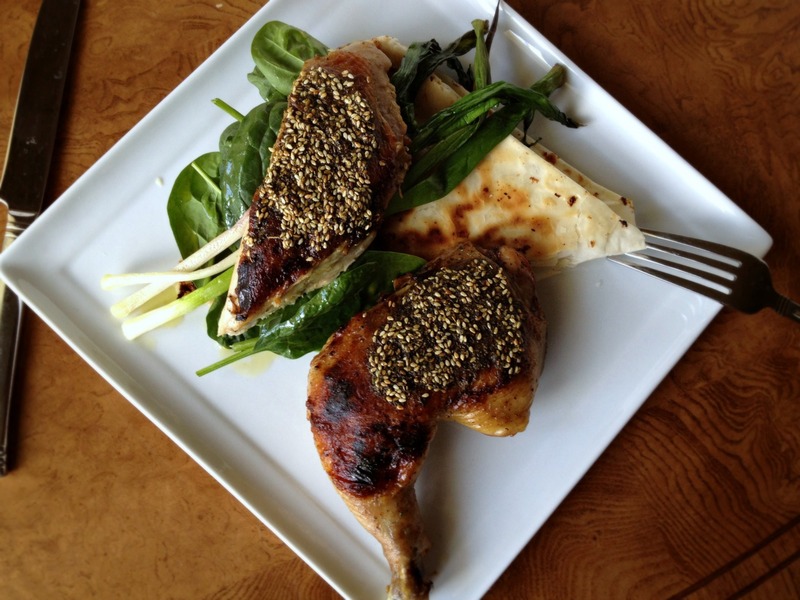 Return chicken to oven and cook until za’atar mixture appears slightly dry and breast registers 160 degrees and thighs register 175 degrees, about 10 minutes. Transfer chicken to cutting board and let rest for 15 minutes. Pour fat in skillet through fine-mesh strainer over bowl; discard solids. Wipe out skillet with wad of paper towels. While chicken rests, heat 1 tablespoon strained fat in same skillet over medium heat until shimmering. Place 2 pancakes in skillet and cook until golden and slightly puffy, about 3 minutes per side. Whisk remaining garlic oil and lemon juice together. Transfer pancakes to serving plates. Top each with 1 handful baby spinach, then with 3 ramps. 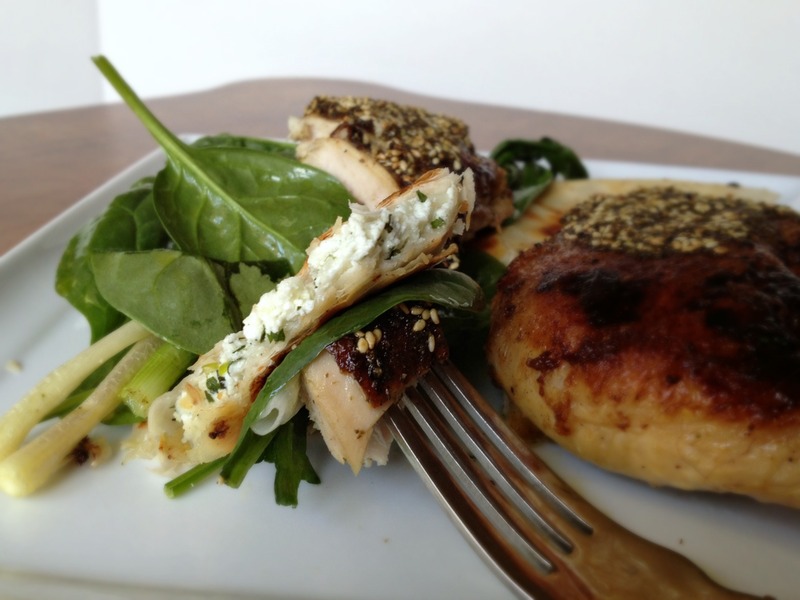 Lightly drizzle greens and ramps with lemon vinaigrette, top with chicken, and serve. *The chicken recipe was not developed based on or adapted from the chicken recipe in Spice. I’m not normally a big cheese eater but the idea of that herby cheesy pancake along with beautifully moist chicken is such a good idea. Totally need to recreate this! That looks like something I’d like to make. I get really bored with our whole chicken recipes…they are good, but rarely stray from a basic roasted or grilled chicken. After awhile, it’s a little tedious. I love the pancake, too. I have to say, I’m impressed that you manage to cook such lovely meals for yourself. It’s a good quality! That’s so nice of you, Carmel! And through this comment, I’ve found your new blog. It’s wonderful! Can’t wait to see where the journey leads. I love Oleana too but since it’s so expensive, I find myself much more often at Sofra :) The cheese pancake looks lovely. Ah, I love Sofra just as much–I’m due for a trip. Oleana is definitely a splurge restaurant. Oh my goodness. That looks so delicious! I will definitely add Oleana to my go-to list for my next trip to Boston (sadly it doesn’t happen often enough). And will add this to my to-do cooking list. Oleana is definitely worth a visit. I should have mentioned that all of the produce comes from Chef Sortun’s husband’s beautiful farm, and the meat and dairy is most always local. Yes, the Patio is perfect for the summer–just hard to get a seat!